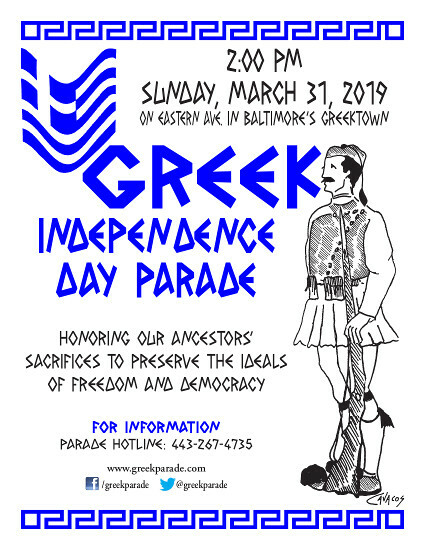 BALTIMORE, MARYLAND -- Colorful, traditional costumes and ethnic pride of both young and old will fill the streets of Baltimore on Sunday, March 31, 2019 at 2:00 PM, as the Greek-American Community commemorates Greek Independence Day with a festive parade in Baltimore's historic Greektown. We mark the 198th year since Greece's declaration of independence from Ottoman Turkish rule. Greeks and Philhellenes gather on this solemn, yet joyous, occasion to remember our ancestors' sacrifices in defeating the tyranny of slavery. They protected and preserved the ideals of Greece, the birthplace of Freedom and Democracy. Greek Independence Day is celebrated in every corner of the world and we bear the responsibilities as our Greek and Philhellenic forefathers did to further this legacy. We welcome one and all -- especially, our children, inheritors of our traditions and future guarantors of these ideals. The parade will feature dance groups in ethnic costumes, children groups, and Orthodox Clergy from the Baltimore-Washington area. These groups come from as far away as Ocean City, Hagerstown, and Frederick, Maryland, Washington, D.C., Falls Church and Fredericksburg, Virginia, as well as Lancaster and York, Pennsylvania. Delicious ethnic food will also be available. The parade route proceeds from Haven Street, up Eastern Avenue, turns right onto Ponca Street and ends two blocks past the Saint Nicholas Greek Orthodox Church at Fait Avenue. We encourage all groups who would like to participate in our parade to register online. 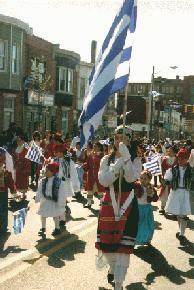 For more information call the Parade Hotline at 443-267-4735, email us at info@greekparade.com or click here.